I love sandwiches and toasts. When it comes to cooking I always look for easy options. For a lazy person like me sandwich is a very convenient option. It depends on what kind of sandwich you make. I want to make my food easy, quick & tasty (yes sometimes I compromise on nutrients). My quest leads me to discovery of Dr Oetker Fun Foods sandwich spreads. Today I will be reviewing Dr Oetker Fun Foods Cucumber & Carrot sandwich spread. About the product – Dr. Oetker was established in the year 1891 in Germany. Dr. Oetker India Pvt. Ltd was established in 2007. In 2008 company acquired leading company of western Cuisine in India, Fun Foods. They have huge product range from mayonnaises, sauces, spreads, salad dressings, cakes, dessert toppings. 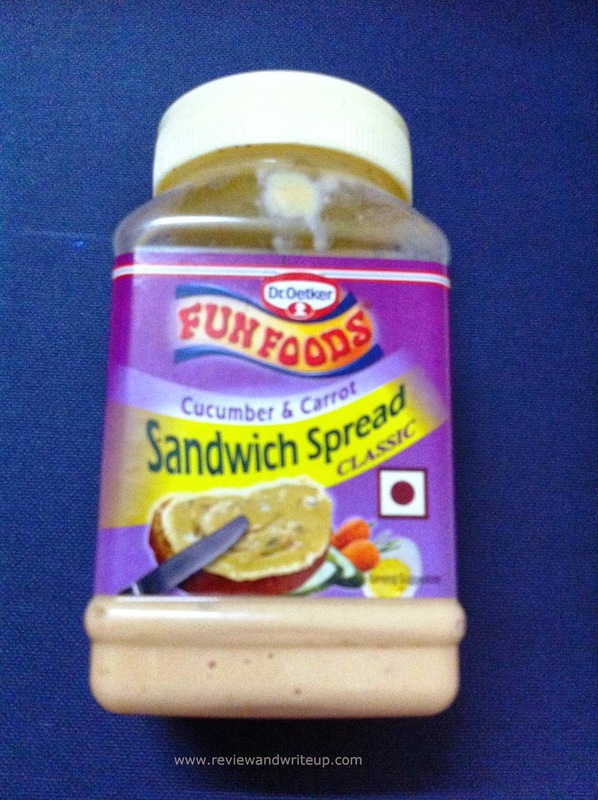 Cucumber & Carrot Sandwich spread is one of their best available products in market. 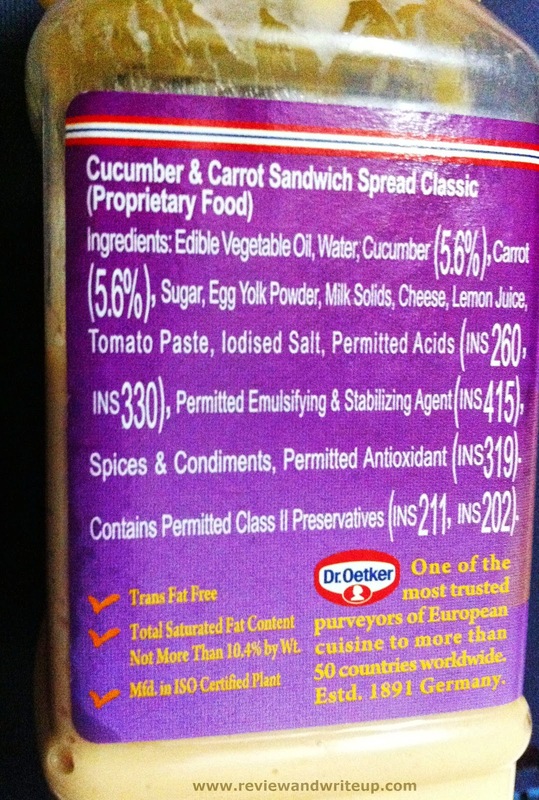 Key Ingredients – Cucumber, carrots, egg yolk powder (yes it has red sign on it), cheese, tomato paste, edible vegetable oil. Nutrients – As expected it has high number of calories and fat. Packaging – Spread comes in a sturdy transparent jar with yellowish cream color lid on it. Once lid is removed spread is sealed with strong aluminum foil to preserve the spread. 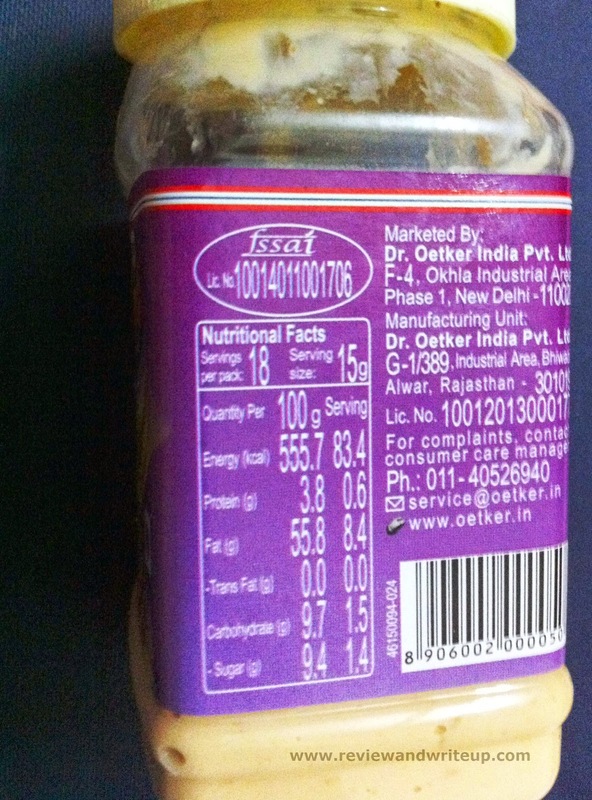 Dr. Oetker Fun Foods sticker is pasted around the jar with product, manufacturer and other details all over it. The jar is convenient to keep at home without fear of spread being spoiled. Claims of the product – Cucumber & carrot sandwich spread makes the tastiest, creamiest & easiest sandwich. Its mild flavor enables you to be creative. My experience with the product – My favorite sandwiches is cucumber, lettuce, tomato. So this spread gave me all at one place. I enjoy experimenting with my sandwich. At that time in my head I imagine myself as world’s famous chef. I take two slices of bread and cover their one side with spread, then add tomatoes and that’s it. My breakfast is ready. I eat sandwiches in breakfast only. Spread is so creamy and yummy. It has made my life easier. Me and my sister we both are working and sometimes are not in mood, or don’t have much time to cook. We go on sandwich drive then. The taste of sandwich lingers in my mouth till sometime. I completely agree with product claims to be tasty, creamy and easy. Since its high on calories and fat, I take just one sandwich not more than that. I combine it with cup of coffee or warm milk. Even for working mothers it will be great option. Kids will love it for its great taste. It will keep the kid full so mommy is not worried. It’s not only easily available but is also very easy priced as well. It has shelf life of five months from the date of manufacturing. Once open you have to keep it refrigerated and should be consumed with in a month. Availability – I find these easily in big bazaars or any other supermarket nearby. R&W Recommendation – Yes it’s definitely worth adding to your kitchen. If you are a foodie don’t miss it.